We live and work in SC full time and love visiting the Panhandle when the beach house is not rented. We fell in love with the crystal white sand and the clear water and the laid back 30-A lifestyle. We love the area and its a very friendly community. Our beach home is located on a dead end so its quiet and not much through traffic. We are ideally located between Panama City and Destin and only 2 miles from Seaside. Its a perfect spot. Placemat assortment, cloth napkins, blender, mixer, toaster, coffee makers, wet bar and library. Amazing views and fantastic layout! We just finished up spring break with two families, including two couples and six teenagers. The pictures do not do the views from the back deck justice. The white sand and clear blue and green waters are stunning. The house was in pristine condition when we arrived. The layout is totally suited for a multi-family stay, with essentially two master suites downstairs and three bedrooms upstairs. You have your own beach access, and there’s a complimentary umbrella and two chairs that come with the house which are set up by the nicest “cabana boys.” Robin was prompt, friendly and thorough in all our communications. My only regret is not being able to book again and have the opportunity to look forward to another stay at Seanest! If proximity to the beach and water, with an unobstructed view, are the priority, this is a fabulous location with plenty of space for all. My family and I ( 5 adults,2 children ) thoroughly enjoyed a week of great weather with enough room, and individual privacy, to enjoy it. The condo was good. The area was more crowded than the beaches we have stayed at in that area. The water was brown due to Eastern Lake. We ran out of gas in the grill with supper on it and it was locked so we couldn’t change the bottle. Parking and driving due to people parking ever which way made it difficult to come and go. My sisters and I took our mother for her 80th birthday. She wanted a beach front vacation. The house had a fabulous beach front view of the Gulf of Mexico in a residential setting. The deck was a relaxing place to sit and watch the waves and the people. It is next to the beach access but that was not an issue. The bedroom set up wasn’t ideal for our group but who cares as we were at the beach most of the time. The kitchen was stocked with utensil and cookware and plenty of towels in the bathrooms. Robin was very responsive and helpful. I would recommend this rental for a getaway on a beautiful white sand beach. 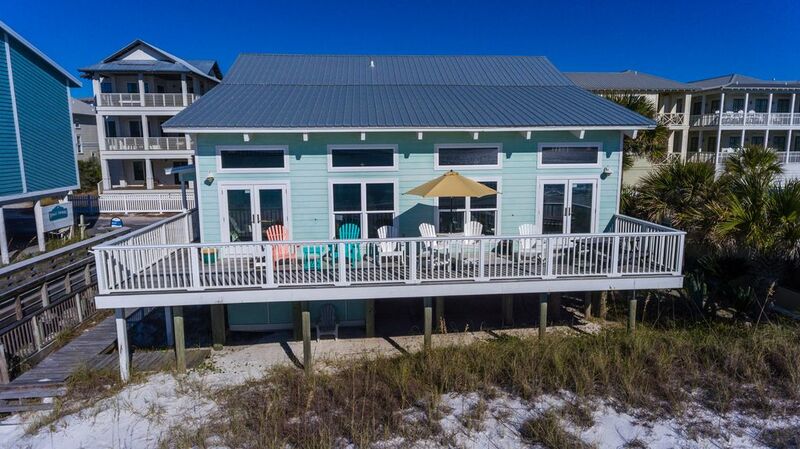 The Sea Nest is located off 30A in Seagrove. We loved that it is away from the hustle and bustle of Destin and Panama City Beach. There was ample parking for four vehicles. With five bedrooms, The Sea Nest provides sleeping accommodations for our large family, with nobody having to sleep in a common area. When one opens the door and glances to the right, the view is breathtaking of the gulf through wall of windows and doors. Step out onto the deck and have a seat on comfortable Adirondack chairs and rockers. The kitchen is well equipped and a drink bar has an ice machine. The beds are comfortable. The air conditioning is very adequate. Our only complaint was that we had to leave and come home. We are a group of retired teachers with spouses and friends who vacation together twice a year; we have been enjoying our trips together for almost 30 years! After our twice a year visits to SeaNest for the last three years, it has become our favorite vacation home. It is IDEAL for our group. We love that the house is directly on the beach, has five separate bedrooms and four baths, includes adequate utensils and cooking gear, and feels like "home' to us. The owners are easy to work with and are prompt in their responses. For our latest trip during October of 2016, everything went as planned. The updated kitchen is beautiful, the living room furniture is new, and the whole house is comfortable. We love it and will continue to visit as often as possible. 2 Miles from Seaside. Great spot for families in peak season and offseason festivals such as Seeing Red Wine Festival in November and 30A Songwriters Festival in January.